Taking on a press car with full knowledge that it will be replaced within a year by something that, at least on paper and in concept form, appears to be ten times the car the current vehicle is, doesn’t exactly define smart. 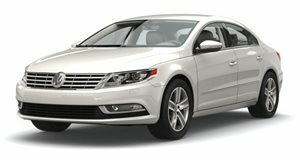 However, a previous winter trip to Arizona saw me slumped behind the wheel of a Volkswagen Passat and it would have pained me to not give its prettier “four-door coupe” derivative a go this time around, if only to see what Volkswagen was thinking when it built the darn thing. Within a day of landing, a representative was at my door with the keys to a Harbor Blue Metallic CC in hand. A glance at the Monroney sticker shows that Volkswagen is making big claims despite a short option-free features list, mainly because the $35,340 base price, which includes the $865 destination charge, was $3,535 more expensive than the vastly more loaded and practical Passat. Practical, of course, is a relative term because the very German CC is oriented as logically as possible once you get over the fact that the starter button is near the shift lever. Like all other Volkswagens, the CC is a refuge for the obsessive compulsive among us. Buttons feel solid, unlike the loosely cobbled together interiors on some modern American cars we won't mention. Doors shut tightly with a solid thud and every interaction between car and driver was a preordained exchange of input and output through a tight and well-oiled medium. The layout was nice too, spacious up front despite the sloping roofline and able to hide its age on the technological side of things with a 6.3-inch configurable touchscreen display giving access to the radio, Bluetooth settings, navigation, back up camera, and an info screen that displays everything from the cheapest nearby gas station and traffic information to movie times at your local theater and scores of your favorite preset teams. Despite the current-gen software, the interior felt aged. A Desert Beige color scheme with contrasting Black Leatherette strewn across the seats almost gave reason to forgive that offense, but an ugly steering wheel hurt the prospect of a full reprieve. Once the turbocharged 2.0-liter four-cylinder engine is awakened, most of those complaints go away. Take a second to imagine the sort of person who buys this budget four-door coupe, a cheaper alternative in a class inhabited by the Audi A5 Sportback or BMW 4 Series Gran Coupe that offers less luxury and fewer toys but is stylish nonetheless. More than likely, that crowd actually wants the full experience and is willing to sacrifice the toys. Good news here because the CC drives like a grand touring coupe. Smooth doesn’t even begin to describe it. With ample amounts of sound deadening and an artfully crafted suspension that both relays the dynamic situation going on underneath while doing away with the discomforts of Tucson’s pothole-infested roads, the CC is a home away from home on surface streets. Characteristically for luxury cars outside of this class, the CC can attain speeds much higher than the posted limits without the driver knowing it. Glancing down at the rather alarming story the speedometer tells is the only way to find out that it's only a matter of time before speeding tickets become a factor. Armed with 200 horsepower going to the front wheels through a silk smooth 6-speed automatic—never advertising when it’s shifting gears—60 mph is handled in 6.5 seconds. This is no drag strip rocket, nor is it a high precision corner carving tool, but the acceleration exhibited at the onset of throttle application and the balanced handling that takes place when tossing that momentum into a turn is convincing enough to keep up the luxury grand tourer facade, even with numb electric steering. It’s characteristics like these that make the CC an incredible budget luxury car for the suburban commuter, like a Phaeton but for a customer wanting a cheap BMW 4 Series Gran Coupe rather than a budget Bentley. It’s within the city limits that its biggest downfall is most apparent. That would be turbo lag, loads of it. Metaphorical tons even. So much that it undermines the entire experience and is the bane of the CC’s existence. It’s not just the fact that the driver must apply the throttle and then wait about 1.5-2 seconds for a reply that’s the worst part. It's the huge discrepancy between throttle application and acceleration, making it so throttle input is never a reliable indicator of how much power you’ll get out of the engine. It forces a driver to take pause on gaps and wait for traffic where a left-hand turn could be accomplished easily in any other car and gives a jolting sensation when the light turns green. You press the throttle, get nowhere, then are smacked with too much forward thrust and must ease off. As with most turbocharged engines, the lag is a symptom of the fuel-cutting measures Volkswagen has had to enact. At least these have proved to be effective. During my week with the CC, I averaged 24 mpg (out of the EPA's 25 mpg combined, 22 mpg city, and 31 mpg highway) while driving in the city and using the four-door coupe as a shuttle. In this task, the CC gives up a bit of ground to the Passat given the cramped low roofline over the rear seats and 13.2 cubic feet of luggage space compared to the Passat's 16 cubic feet. At least the rear seats can fold down and expose more trunk space, though anyone that plans to use that feature frequently should get something that's not as good-looking and a tad more functional because, well, beauty is pain—manifested in the CC's case as rear passenger neck pain. When not experiencing stop and go city driving that lets that dammed turbo lag emerge, the CC’s comfortable dynamics reflect the price. The lack of standard features do too. Notably missing are the driver aid features like blind spot monitoring, adaptive cruise control, and lane departure warning that Volkswagen includes in many of its cars. Our beloved automatic parallel parking feature from the Passat was absent as well.